I have been researching and writing about consumer electronics for over 13 years. 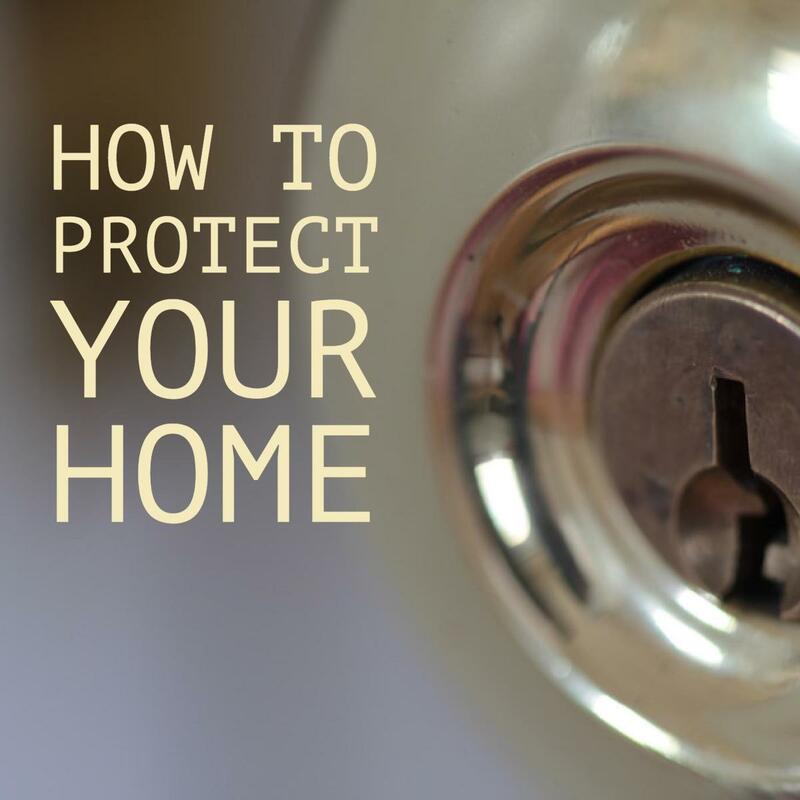 Every home can benefit from door security devices to protect the occupants and their belongings. Home invasions are a common occurrence in many areas of the country. Millions of people live by themselves or in shared living situations where they may be particularly vulnerable. Increasing security may be important for many homeowners and renters, but the cost is often a prohibitive factor that bars them from taking preventative measures. Luckily, however, there are a number of door security devices, and other security options as well, that are very affordable and yet effective. The items shown on this page are also very simple to install. Some of them merely slide in place, while others only require drilling a few holes. Some door security devices offer alarms to scare off intruders and alert homeowners while others physically act to stop any forced entry. Any one of these items can help improve the level of security of your home, but in some cases, using more than one measure is the safest bet. One type of door security device is an alarm. There are monitored alarms systems and unmonitored alarms. Certainly, there are security systems that will provide alarms as they monitor your home for a monthly fee. They will alert you to intrusions and send help if needed. A search online will reveal the options. ADT Plus is just one example of a recognized leader in monitored home alarm systems. Even if you can't commit to the monthly expense of a monitored system, you can install some alarms yourself. You can set up door and window alarms that will sound to scare off intruders as well as alert you to the possible danger. 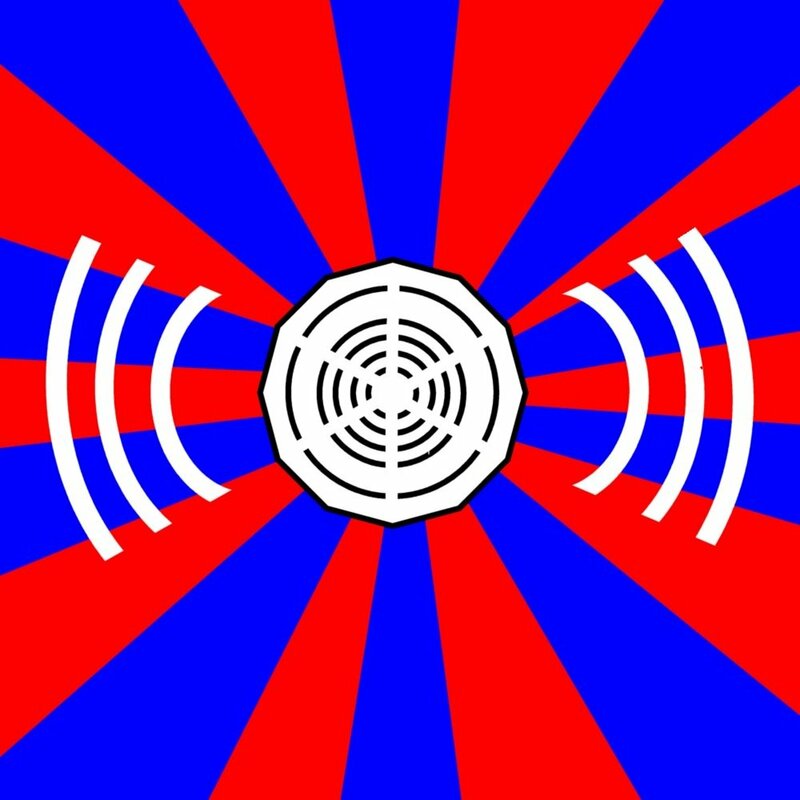 In some instance these devices will also call numbers that you program into them, alerting you or whomever you choose. 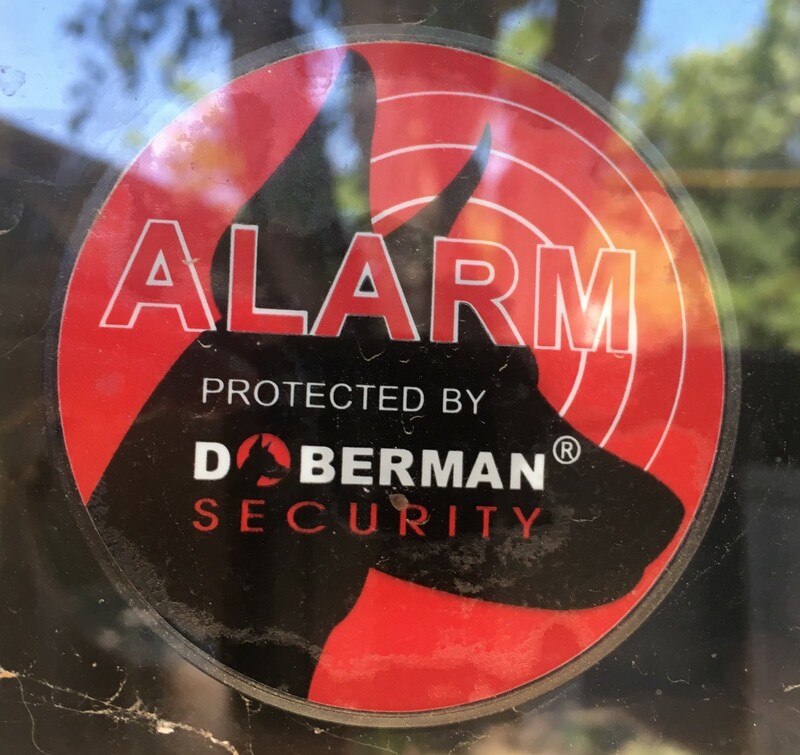 GE, Sabre, and Doberman Security among others make these affordable devices. One type of door alarm is a simple door stop alarm. There is no real installation required. It merely slides under the bottom of the door. Then, if someone attempts to open the door, a 120dB alarm goes off scaring away the intruder and alerting you, and potentially your neighbors, of the attempted entry. Doorstop alarms are highly portable; if you are going to be traveling, you could potentially take them along to place under your door in any hotel. These alarms are often priced under $10. Some alarms are just a bit more sophisticated. For instance, another popular option involves mounting a base station on the wall and a sensor over any doors or windows you wish to monitor. When motion is detected, the alarm sounds which warns intruders they have been spotted. 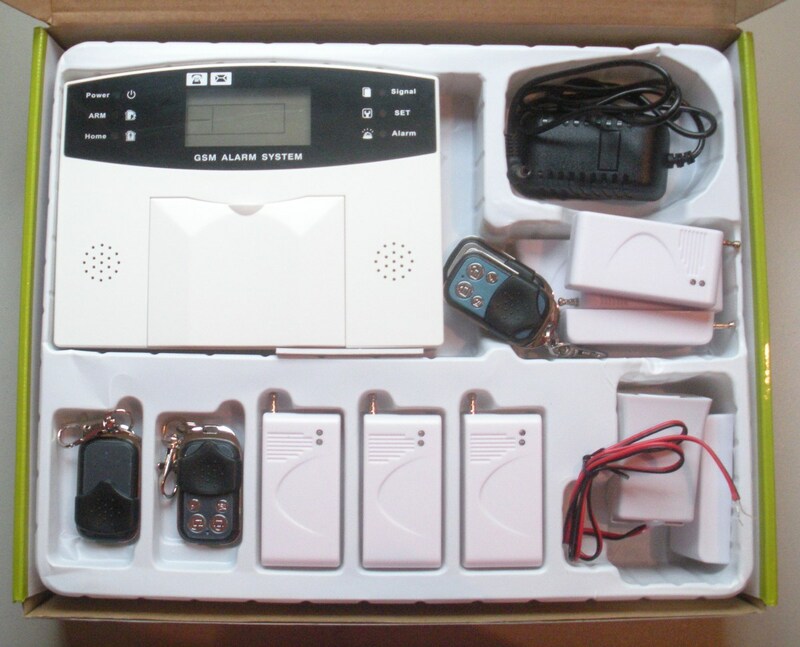 The alarm alerts those in the home, and in many instances, will use an emergency dialer to call phone numbers that the user has programmed into the device. The dialer will then play a pre-recorded message to those who receive the call. These systems are also easy to install and operate wirelessly, although the base station will require cords to plug them in for AC power and a telephone line. They often use peel and stick adhesive for mounting or perhaps the use of screws if desired. These alarms are generally available for $15-$90 depending on the level of sophistication and number of doors/windows to be monitored. There are also door security devices that act to prevent an unwanted entry by securing the door. Security bars for regular doors can act as a brace that makes it nearly impossible to break in through a doorway. These devices are very easy to install and can be removed with little effort by the occupant of the home so that they can easily evacuate if necessary. Some of these bars are made from aluminum but the best of them have steel construction and are a bit heavier. They simply slide under the doorknob and brace against the floor. It's important to follow manufacturer instructions for optimal performance. The angle at which you place these bars is important. These bracing security bars can vary in price from around $20 to $120. Be sure to research your choice, but in general, you get what you pay for. Some of these security bars are made to brace sliding patio doors and windows. Some include a loud alarm that will scare off intruders and alert the occupant of an attempted break-in immediately. Of course for sheds and other structures where aesthetics are unimportant, a horizontal security bar that fits into brackets screwed into each side of the door jamb offer great security as well. Clearly, the brackets are permanently mounted. Locks are another option when you need door security devices. 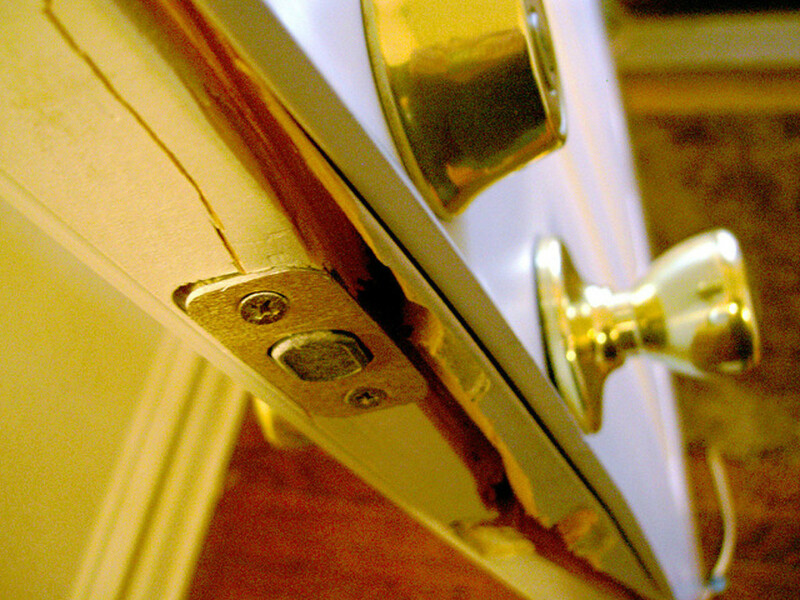 Good locks are one of the first lines of defense and will thwart many home invasion attempts. 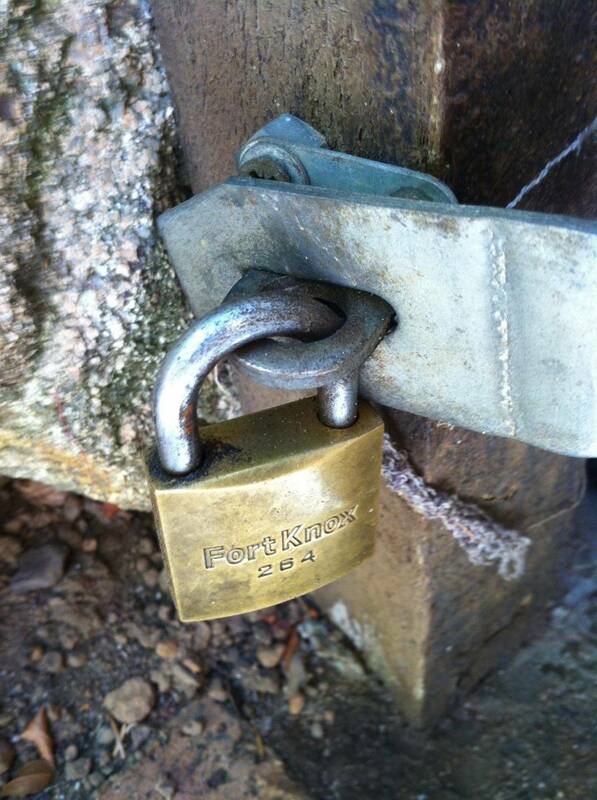 Most locks are affordable and can be installed by the homeowner as long as they are comfortable using a few tools. Deadbolts, of course, can be part of your security solution. They are installed in the door and extend into the door jamb, making forced entry very difficult and very noisy. They can be unlocked/locked with a key from the outside and operated with the flip of a knob on the inside. Some of these deadbolts can also be operated with a remote control key fob from distances of 20-30 feet. Deadbolt locks that provide the highest security may include a high-security strike plate, 3" screws which will penetrate wall framing rather than just the door jamb, and they may use staggered screw placement as well. Some may even feature anti-saw pins and anti-drill features to thwart intruders who seek to break the lock. A good deadbolt should have a 1" throw. These locks are available in a variety of finishes so that they can complement other door hardware since they are highly visible from both inside and outside the home. Brass, antique brass, brushed nickel, pewter, antique bronze, and others are available. On average they are priced between $20 and $200 with quality and effectiveness varying between the different products. 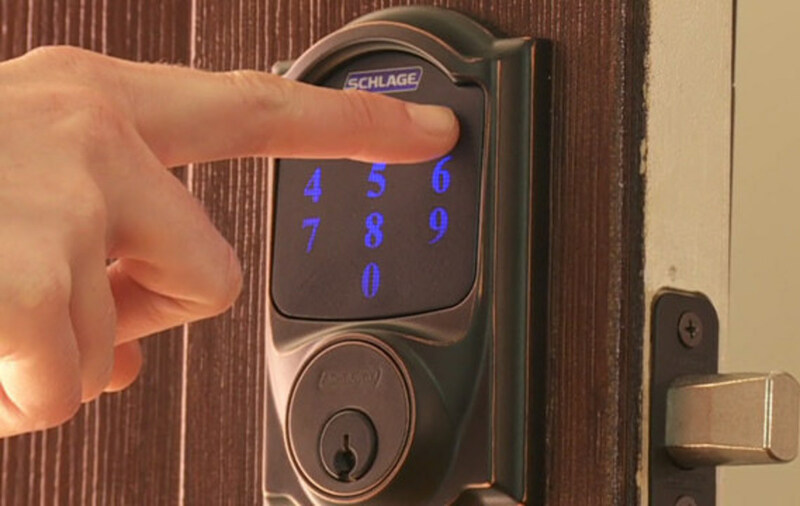 There are a variety of keyless entry pads, many of which now include Smart features. Biometric fingerprint recognition locks are easy to find. These may include more than one deadbolt and they also provide some extra protection in the sense that they don't require you to dig through your purse or pants pockets to find your keys leaving you vulnerable as you stand on the front porch. In addition, there is no lock to pick. You can enter the door via a passcode or perhaps with fingerprint recognition. Users can be added and deleted and typically they install directly over the existing holes in the door so installation is quite simple. These are typically more expensive, costing around $150-$500. Some of these are also considered smart locks which connect and work in conjunction with other devices in your home. For instance, they may allow you to enter your home using your phone. If you have your phone on you, it recognizes you automatically. They may also work with devices like Alexa, Siri, Google Assistant, etc. to allow you to check the status of the lock and to lock your door via voice control.These typically install within 10 minutes. There are of course more technologically sophisticated options for those who want to do their home security DIY but can afford a bit more. Home security cameras, many with night vision, are paired with sensors for motion detection, alarms, and so forth but can cost up to $500. There are options such as Nest Secure (more expensive) and the Abode Starter Kit (less expensive) as examples. The good news as far as cost is that many of these systems don't require a monthly monitoring fee unless you choose to sign up for it. Doorbell cameras allow you to know who is at the door before answering (or deciding not to answer) and some are smart which allow you to live stream the video to an app on your phone so that you can see activity at your door even when you're away from home. 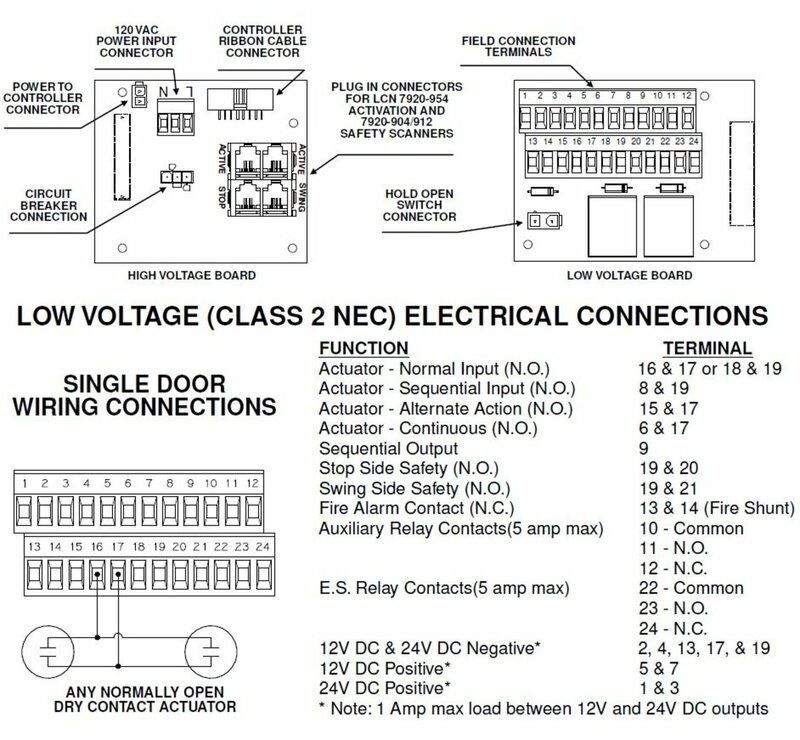 Some are triggered by motion and others by activation of the doorbell. A couple of the options include Amazon's Ring Video Doorbell 2 (which syncs with Amazon's Alexa and Echo) and Nest Hello 2 (which syncs with Google Home devices) which generally start around $200. There are of course monitored systems out there. Some companies will install the equipment at no cost, but then charge you an ongoing monthly fee. 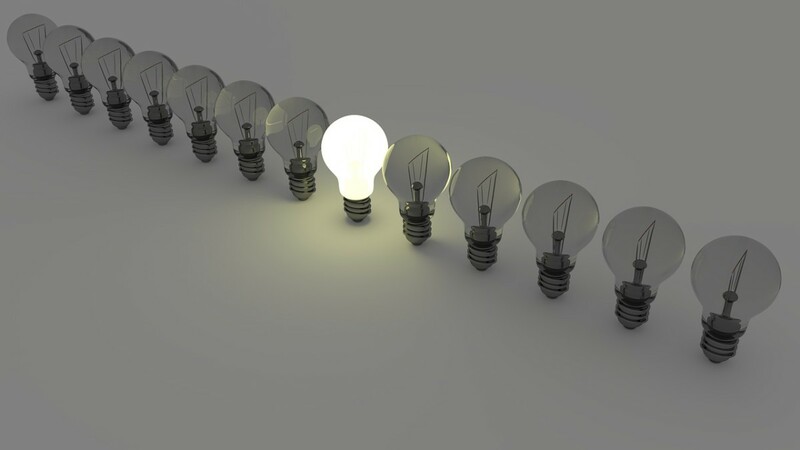 But for the normal purpose, there are simple DIY options that in the long run are more affordable. These are a great idea! I didn't even know they made these! Great tips in this time of high crime! Thank you very much. I get useful information from you. Good tips from you. Excellent review, my friend.